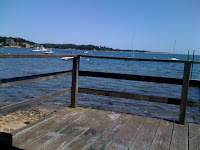 On the bay right outside my window, the breeze rolls small, silver-crested waves in and out as dark green oak tree leaves dance above. I'm fulfilling a tiny, lifelong dream this week: to see a body of water as soon as I open my eyes in the morning (There's a busy road in between me and the bay, but that only makes it more real.) The shapes of the grey waves make me think of the bumps and folds of my brain, now feeling smoother and much less turbulent than usual. Yesterday we went on a tour of the Cape Cod sand dunes, which I never before knew existed. A dense forest covered this spot long ago, well before the European settlers arrived. The topsoil eroded over the years, leaving the fine sand that formed after the Ice Age; when tides threatened to wash away the sand, the Army Corps of Engineers came in and seeded the entire shoreline with grass to prevent further erosion. But the dunes continue to ebb and flow, and our guide wasn't convinced that the grass was a good idea—since it is, in a way, as forced as any other less organic, man-made intervention that prevents nature from taking its course. In a big Chevy van, eight of us tumbled at alarmingly high speed over an unexpected, undulating landscape somewhere between a desert, the moon, and mountains of Shangri-La. I felt like I was on a different planet. It was more fun than a roller coaster, and we could have used Dramamine. We landed at the top of a big hill and saw a sliver of ocean surrounded by wide, rising swaths of tan and green. A grey wooden house that looked like an Edward Gorey drawing sat under distant pastel sky, one of the many artist shacks that pass on to new owners only after death or lottery. I stuck my toes in the sand and said a Sheheheyanu as I looked out to the sea and tried to imagine what was on the other side. With the addition of services for kids and families, the three locations turned into four. Two of those were Big, Fancy, Expensive theaters. It was a monumental production. In the years when my fellow congregants had jobs, we were doing very well with donations, thank you, and could easily cover the rental costs. Everything changed this September. Half my friends are now unemployed. The few rich people I know are much less so. My synagogue--and most others in NYC--are in emergency mode, trying to figure out how to cut costs drastically while still proving the same the services and support. We also collectively realized, along with the rest of the American people, that we let money fly a little too freely. We are now, to frame it in a positive way, back to basics. In a less positive way, it means that we can't afford all those theaters. We approached the original big old church and said pretty please, and they decided to be neighborly. So once again I will have the unique pleasure of praying the Amidah while staring at an artfully masked, 50-foot-tall stained-glass portrait of Jesus and Mary. It's a beautiful church, and in the company of my community I can pray anywhere. That's not the depressing part. What makes me sad is that we'll need fewer service leaders for the fewer services. No one has spoken to me yet, but I have the least seniority of our small crew of hazzanim and hazzanit. I know that everything at my synagogue is done fairly--no favors. So I'm bracing myself for any outcome from not being needed at all, to leading one service, to leading a few. I strongly doubt I'll get to sing at every Shaharit and Minha on Yom Kippur, as in past years. But I've become accustomed to, maybe even addicted to, the intense energy of giving and receiving from the bima on Rosh Hashanah and Yom Kippur. I can hardly remember any other way to spend those days; even before leading I sang in the choir for four years, where I had to do the same sort of thing. Now I'll need re-learn another way of praying, of sharing myself without acting as lens and focus. I've done so on a million Shabbatot, of course--but it won't be Shabbat. My only other experience of the holidays is before I came to my synagogue, when they were just a reason to sit and stare at the back of someone's head before going back home for lunch. I always knew my role as a hazzanit would end--I'm just a volunteer, and that's how it goes. But I thought there would be a better, or at least more dramatic reason; this one is so unfair. As a citizen, I guess I'm as much to blame as anyone for helping perpetuate the economic and political mistakes that brought us to this strange season. Whatever. It is what it is, and sometime in the next month or two I'll find out my new role. I am trying to see this turn of events as a sorely needed learning experience, since I'm very bad at accepting change. And what's the point of angsting over something that's out of my control? I'm also great at over-dramatizing; I need to keep in mind that the holidays are just a small slice of my life, which remains so rich and filled with other marvels that I have no reason to blow these days out of proportion. Finally--I need to remember who I am today, and where I was five years ago. From this experience of leading services I've learned more than I can begin to absorb about myself, life, Judaism, God--even writing. Cosi revaya, my cup runneth over. But the not knowing has made me not want to write about singing, or even sing, at times. So I force myself to do both, and always feel better. It still makes me sad. I want everything to be the way it used to be.